Railpictures.ca - Michael Berry Photo: A baggage car and VIA 6410 bring up the rear of VIA 63 as it passes MP 4 of CN’s Montreal Sub. In the foreground is the Turcot Holding Spur and in the background is the rapidly changing Turcot interchange. The tracks here will soon be gone with CN’s new right of way a bit further north almost ready to replace the current right of way. | Railpictures.ca – Canadian Railway Photography – photographie ferroviaire Canadienne. 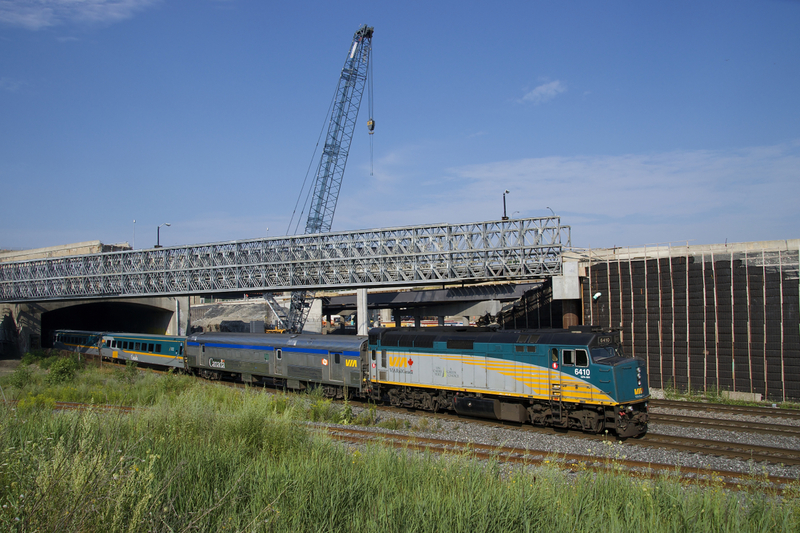 Caption: A baggage car and VIA 6410 bring up the rear of VIA 63 as it passes MP 4 of CN's Montreal Sub. In the foreground is the Turcot Holding Spur and in the background is the rapidly changing Turcot interchange. The tracks here will soon be gone with CN's new right of way a bit further north almost ready to replace the current right of way.